Experts examining the carcasses of 25 dead pilot whales say they were apparently healthy animals before getting stranded on a Sutherland beach. They were part of a pod of 60 whales which got into difficulty in Balnakiel Bay and the Kyle of Durness. Rescuers managed to help most to deeper water. 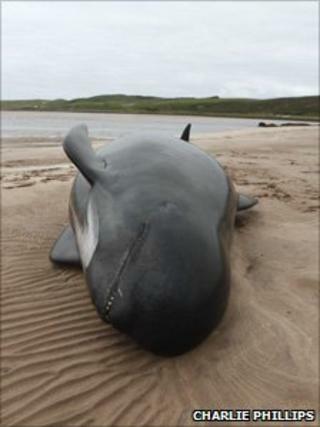 Scientists have now taken samples from the dead whales to try to establish why they beached. One of the team told the BBC that the animals showed no obvious injuries. However, she added that more detailed analysis was needed before they could speculate on why they came ashore. About 25 of the 60 whales which got into trouble did not survive, and post-mortem examinations are being carried out out to establish the cause of the stranding and the deaths of the whales.